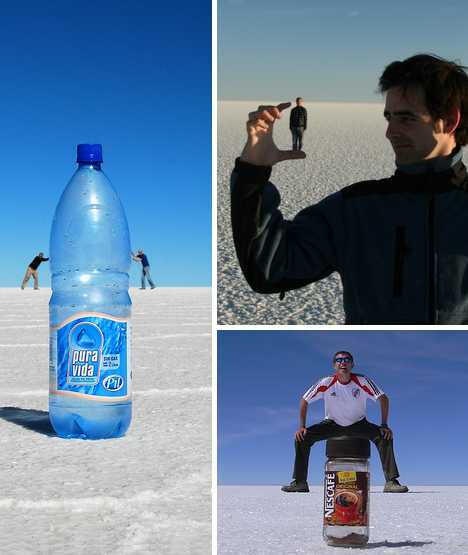 Forced perspective photography is a simple and effective way to mess with viewers’ eyes and brains by playing on perceived visual perception. 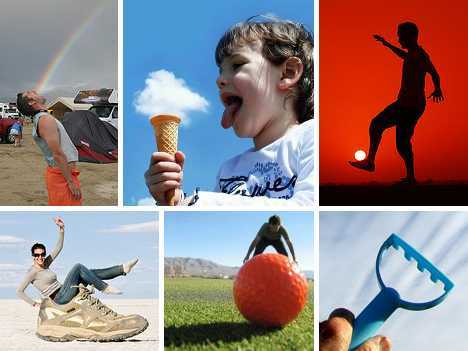 Following up on last year’s awesome assemblage of 15 Phenomenal Forced-Perspective Photos, this new group of forced perspective images explores the many ways creative cameramen (and camera-women) add a little “faux” to their photography. 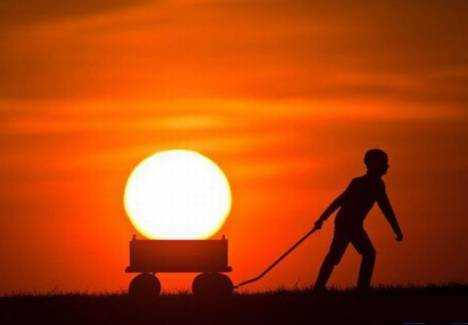 Is there anything more symbolic of life, warmth and permanence then the Sun? Of course not, our friendly neighborhood star, burning brightly for billions of years, is huge enough to swallow our humble Earth and everything on it with nary a burp to show for it. 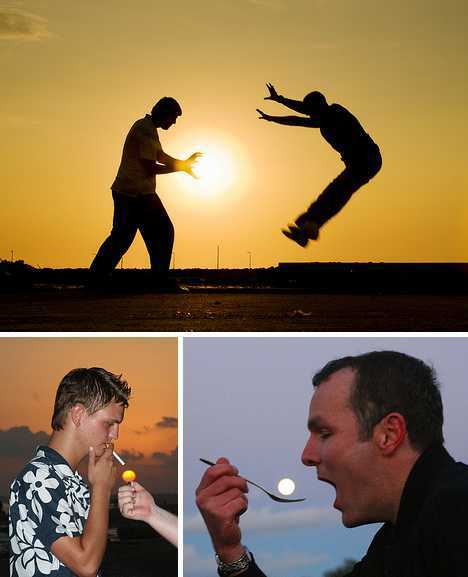 Maybe that’s why the Sun figures so prominently in so many forced perspective photos. Big, powerful stuff scares us, and we have an innate need to cut such potentially threatening, uncontrollable entities down to size… like, umm, soccer ball size. Ever gazed deep into a typical “Simpsons Sky” filled with fluffy white clouds and noticed some clouds that look like, well, anything BUT clouds? 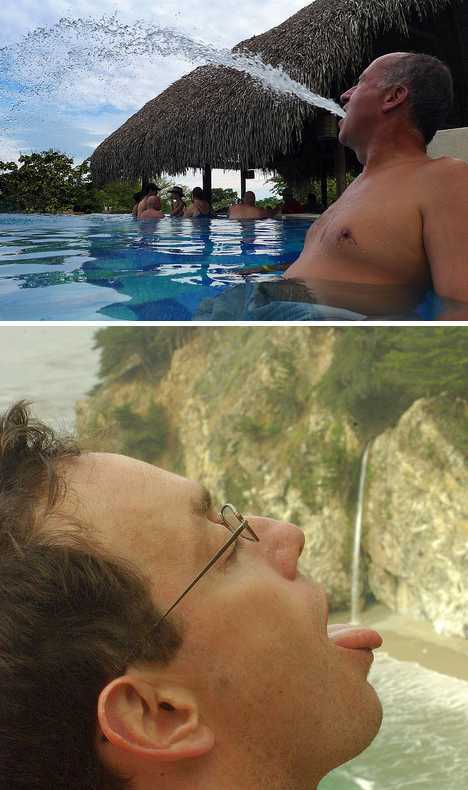 Forced perspective photographers take pareidolia, as it’s technically termed, and run with it. 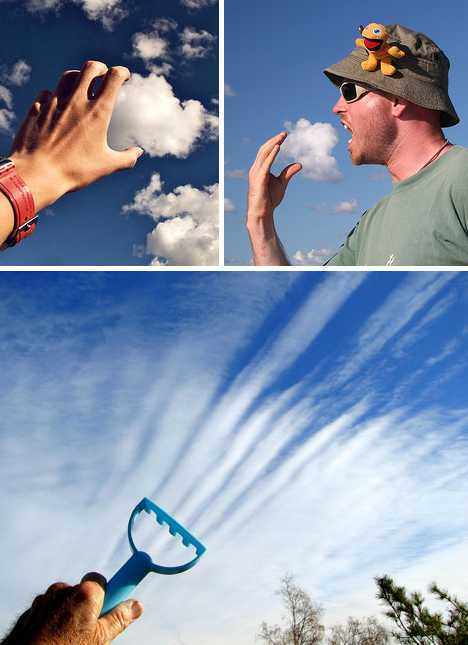 The fact that clouds themselves can look like smoke, shaving cream, a bank of shimmering snow and much more helps our intrepid photogs create some amazing & amusing image compositions. 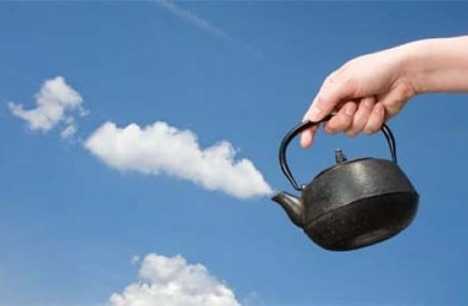 I’ve looked at clouds from both sides now, and still somehow, it’s clouds illusions I recall. I really don’t know clouds at all. 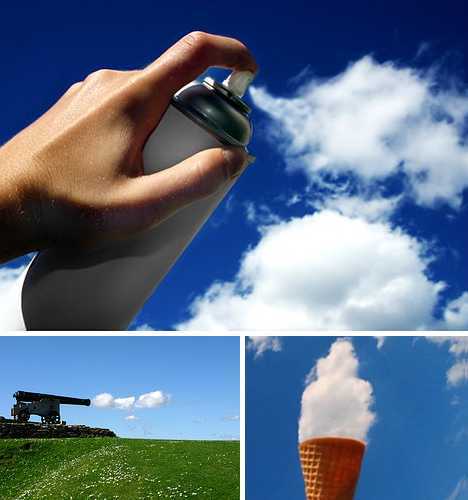 Spraying water? Wet just a second while I get my camera. 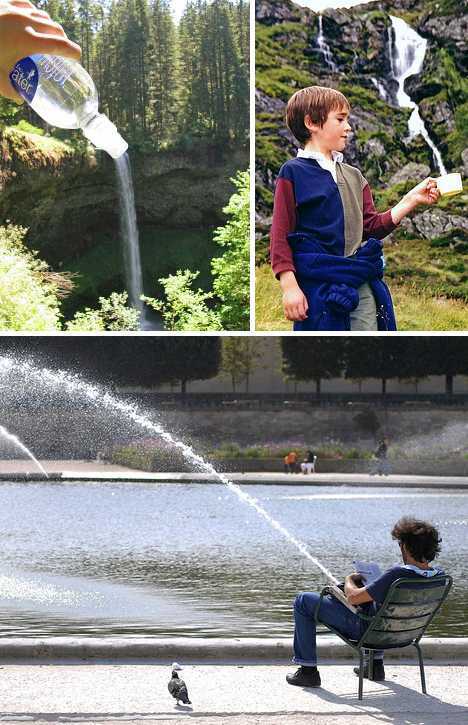 From foaming fountains to wispy waterfalls, flowing water in all its forms is often a large-scale phenomenon providing copious opportunities for forced perspective photography. Flowing water from almost any source typically has a counterpart in miniature: spurting founts and spitting louts, tumbling tributaries and trickling refreshment poured into one’s cup – or more directly. It’s all wet, all right, and all good. 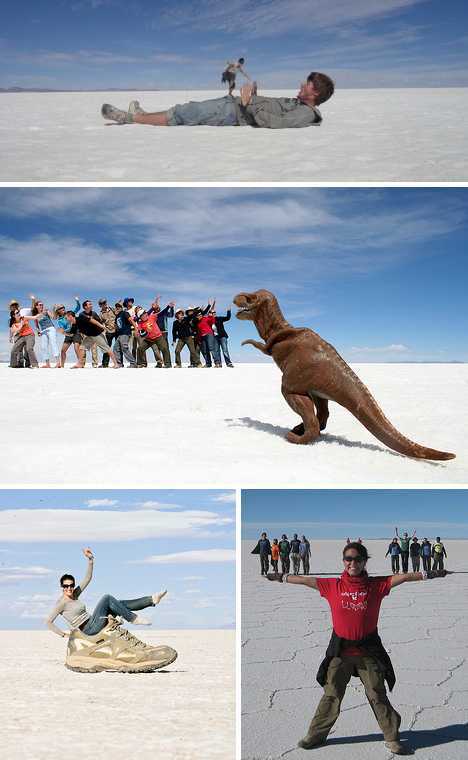 Bolivia’s otherworldly Salar de Uyuni salt flats make an ideal backdrop for forced perspective photography. The high-altitude location’s distinctive lighting, soft colors and far horizons lend themselves to forced perspective photography’s strange content, almost making the subjects of the photos seem quite natural… you might say, unforced. The images above were composed and captured by Kevin Landry, OllieTheBastard, Funkz and Where There Be Dragons. 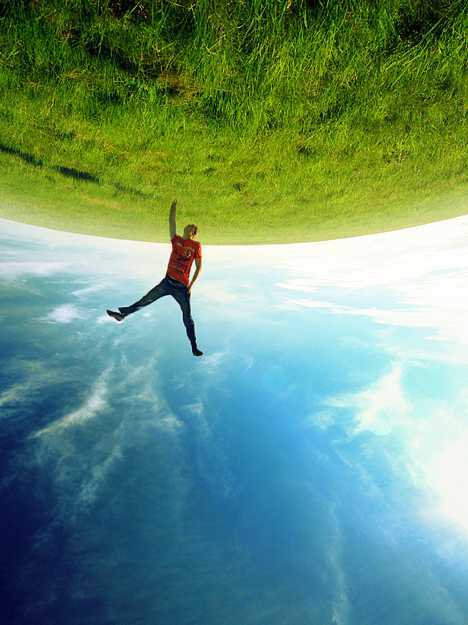 It’s likely that these odd images have inspired more than a few budding photographers to try their hand at forced perspective photography, in the process enriching and enlivening the field. 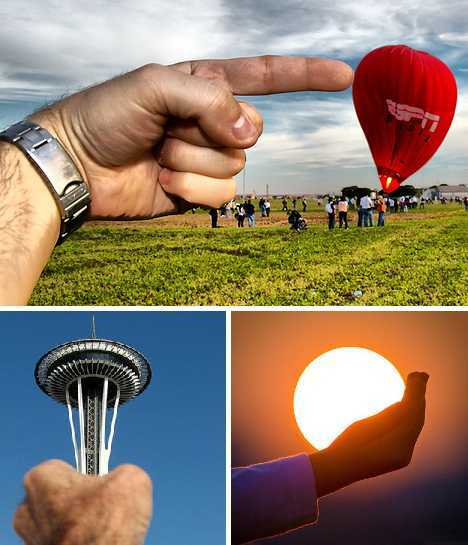 One compositional theme common to many forced perspective photographs is The Giant Hand – actually a normal-sized hand and arm in the near field overlapping some distant object. 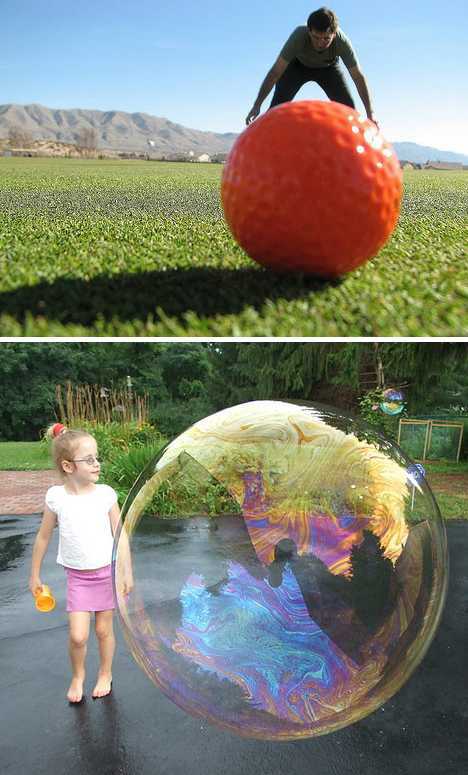 In real life, our depth perception and stereoscopic vision cue our brains to discern the true positions and distances of objects in the field of vision. Photographers with a careful grasp on differential focus and precise object placement can trick the brain, at least initially. 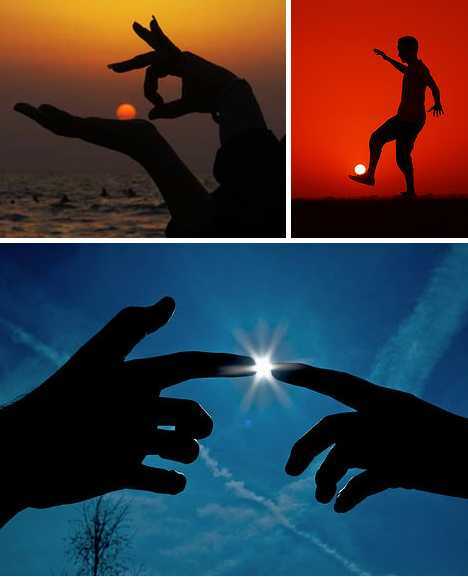 The triptych above illustrates one of the most difficult types of forced perspective photos, in which the main near and far elements must retain their faux-interactive alignment over a short period of time. We’ll never know how many times the swimmer performed his back dive until the photographer could nail three consecutive shots. Get this guy some Skittles, stat! 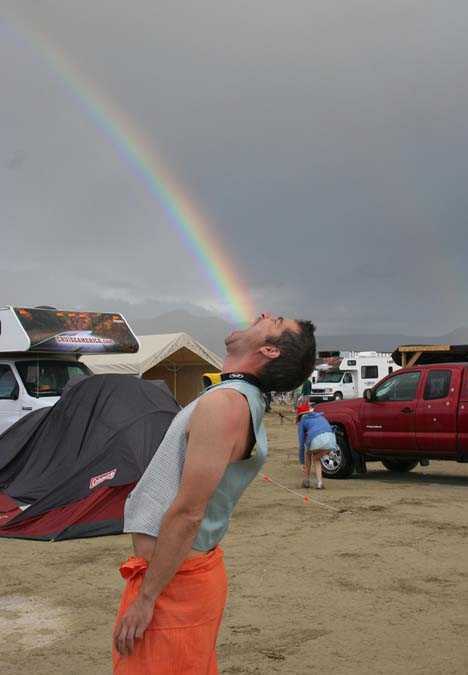 Rainbows rank among nature’s most beautiful phenomena and pose a unique challenge for photographers looking for an unusual forced perspective shot… just how far away is a rainbow, anyway? 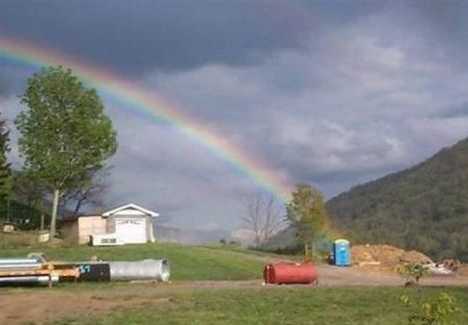 AS far as the old Irish legend of there being a pot at the end of every rainbow, well, those cursed leprechauns never did say what KIND of a pot it was, now did they? 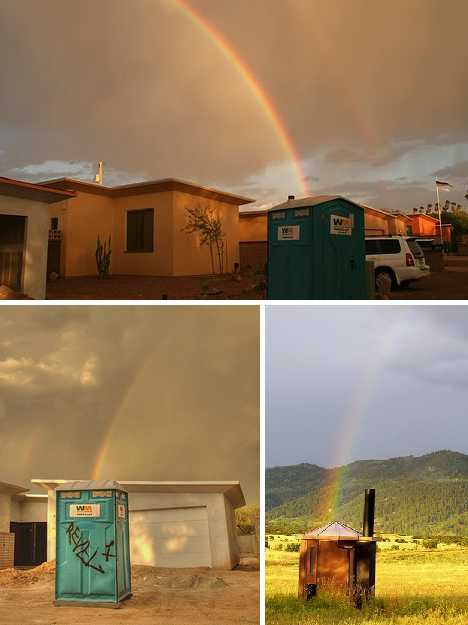 Since you never can get enough “rainbow over the outhouse” photos, here are a few more. The sacred and the profane, together once again! Grasping the Eiffel Tower between your fingertips? Ho hum. 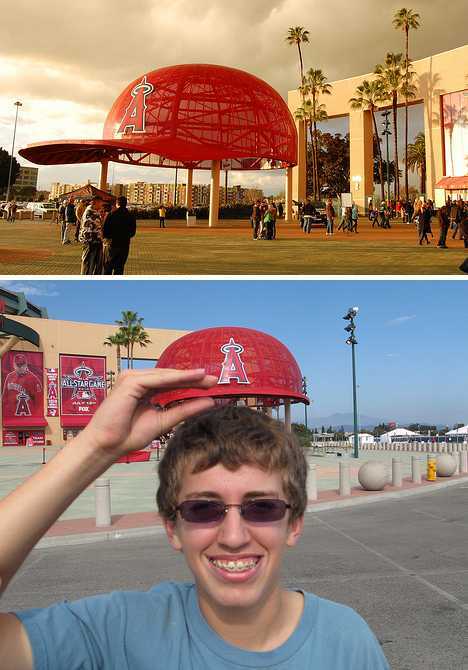 Wearing the big hat outside Angel Stadium in Anaheim? Home run! Of course, the grinning fan above isn’t really wearing that giant hat… the Giants play at AT&T Stadium anyway. 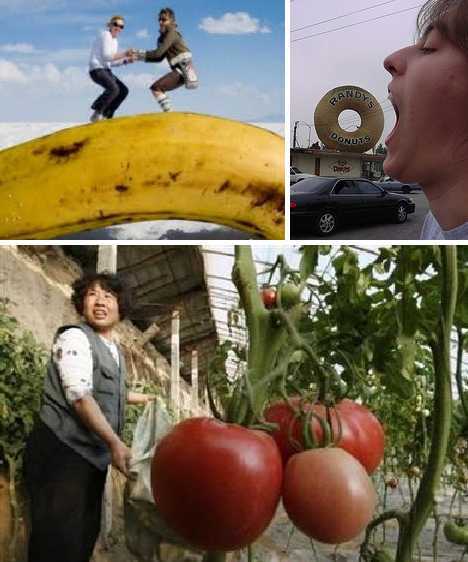 Hungry for more forced perspective photos? Well step right up, sit right down, and open wide. Photographers seem to take unusual pleasure in producing images of us eating really, really big things. 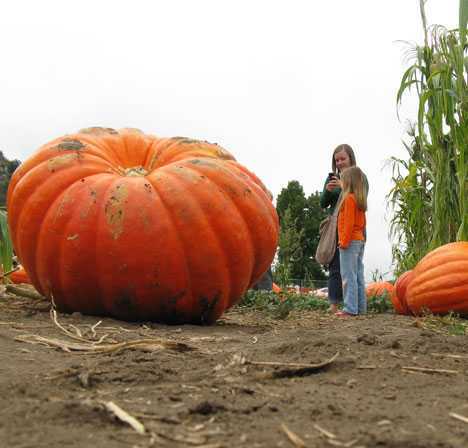 You can keep your Great Pumpkin, Charlie Brown, we’ve got us a Gargantuan Pumpkin! Once hollowed out (and how long would THAT take? ), you can build a bonfire inside for Halloween and bake pumpkin pies for a small city. 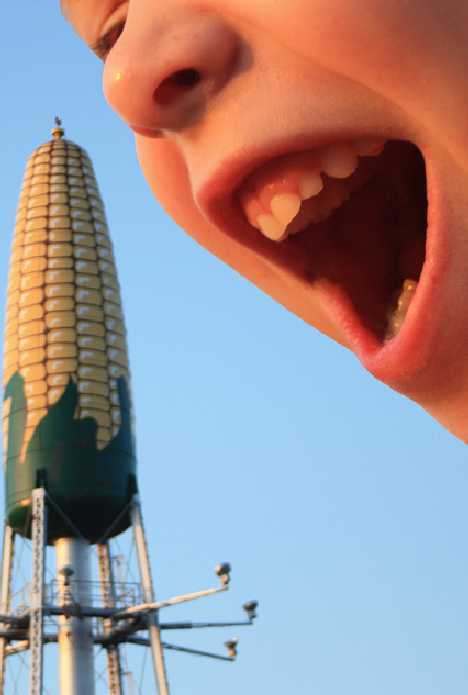 As for the Corncob Water Tower in Rochester, MN, you just knew a photo like the one above was going to be taken sooner or later. 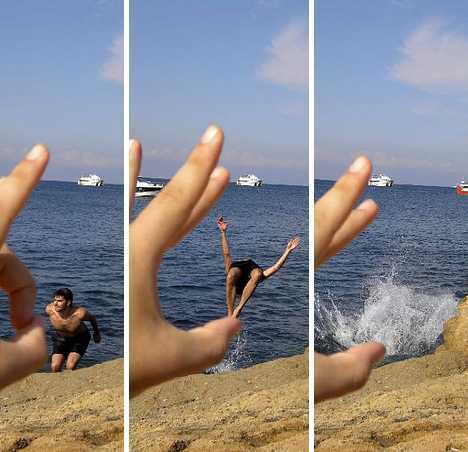 AC/DC might have big balls but with just a little forced perspective photographic wizardry you can too! Then again, you could always be Bigfoot instead. As mentioned, it can be difficult to maintain a sense of consistent focus when composing a forced perspective photograph. Sometimes it doesn’t matter; in fact it’s desirable. 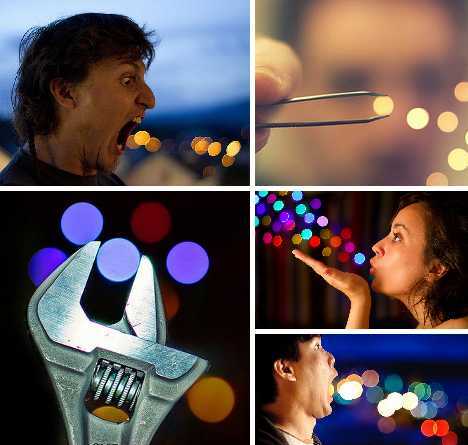 The small selection of “sparkly” shots above shows what can happen when distorted, out-of-focus light adds a little extra unexpected content to a photographic composition. 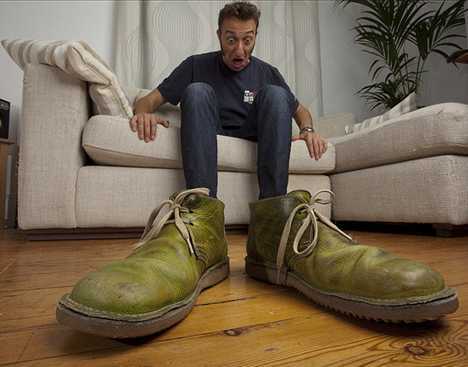 Forced perspective as a first choice? Why not… photography is great for capturing reality but the medium has so much more to offer when the subject is artistic expression. Go ahead, give it a “shot” sometime!